Bible Answers for the sincere in heart. Evangelist B.R. Lakin --If Christ Should Not Return To This Earth What Then? Frequently as an intern in Washington, D.C., I have had a few moments to stand in awe of the towering figure of the Washington Monument. On any given day, gazing up at such a remarkable sight, I am reminded of a fact that not many in D.C., let alone America, know. 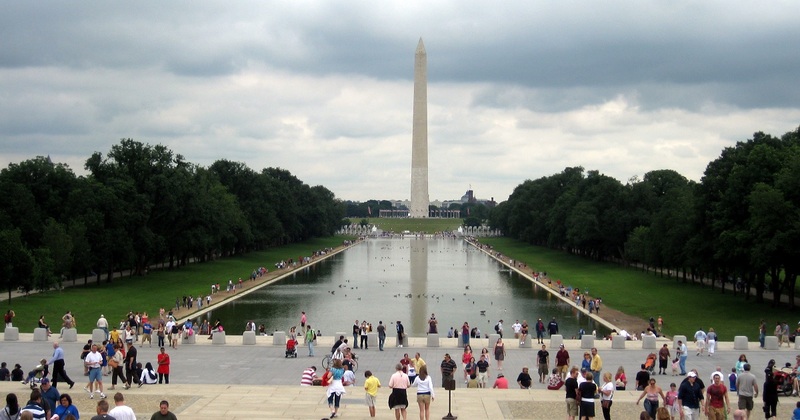 What exactly is at the top of the monument and why is it so significant to America today?According to the National Park Service (NPS), the Washington Monument stands 555-feet high, making it the tallest structure in the area. In 1884, when the monument was finished, the Latin words Laus Deo, which mean “Praise be to God” or “God be praised,” were engraved on the east face of the aluminum cap at the top of the monument. Thus, every morning, when the sun rose, the first ray of light to touch D.C. landed on this engraving. The original builders wanted this to symbolize God being given the glory as the first thing to occur every morning. It is a beautiful piece of history and an even more powerful testament to what God has done for this nation. Unfortunately, the story of this gorgeous engraving doesn’t end here.In 1885, a lightning protection system (or collar) was installed over the top part of the original cap. Though it protected the monument, it rubbed off the original engraving, rendering the Latin words illegible. In 1934, the collar was restored, but the original engravings were not included in the restoration project. Instead, a new engraving was added to the cap. The top of the monument now reads: “Repaired, 1934, National Park Service, Department of the Interior.” This wording was placed directly on top of the original east side engraving Laus Deo.This story is a fitting illustration of how many leaders in our government operate today—how they work to obscure the Framers’ original intent to honor and glorify God. Similar to how the words Laus Deo were covered over on the top of the Washington Monument, forces are at work in our government to erode, destroy, and erase the Christian heritage of our nation. So many of us today, instead of first giving the glory to God for everything we have, lean on our own “power” and “authority.”We have done this in two ways. First, we as citizens are overly relying on the government for assistance and guidance to prosper. Former Senator Jim DeMint said it best: “Over the last 50 years, American attitudes have shifted from cherishing self-sufficiency and personal responsibility to craving cradle-to-grave security ‘guaranteed’ by government.” We are increasingly looking to the government to provide all our needs and even our desires, like free college for all. According to Heritage’s Index of Dependence on Government, in 2013, 70 percent of government spending went to dependency programs.Too many millennials are buying into a narrative of a socialist utopia where the government can and should supply all our needs. In contrast, Paul writes in Philippians 4:19, “And my God will meet your needs according to the riches of his glory in Christ Jesus.”Secondly, many of our leaders first seek power instead of surrender. Many lawmakers are wanting to be the solution to our problems instead of pointing us to the only One who can solve our problems. It seems that their desire to be a “functional savior” is fueling their actions so that citizens increasingly rely on them in order to bolster their own image in the culture. Many of our political leaders seem to desire power and glory over truly effective public service.A few recent examples of this include former President Obama trying to take the credit for economic gains that happened after he left office, and Senator Cory Booker using his infamous, self-anointed “Spartacus moment” to launch momentum for his 2020 presidential campaign. It is a common theme in today’s politics—“How can I further my image and my mission?” instead of “How can I get on board with God’s mission?”What America needs today is citizens who strive for personal responsibility and service to others and leaders who are looking first to serve, to imbibe the spirit expressed in the faded, worn out words of the Washington Monument—Laus Deo. We need leaders who serve God (Joshua 22:5; 1 Samuel 12:24; Hebrews 9:14) and their fellow citizens (Luke 6:38; Galatians 5:13; 1 Peter 4:10). Jesus himself said, “The greatest among you will be your servant” (Matthew 23:11). We as citizens need to renew our commitment to being responsible for ourselves but also to serve those in need, and our government officials need to rediscover their true vocation: to be public servants.Alyson Gritter served as an intern at Family Research Council. I've learned a lot from Glenn Sunshine, the longest-serving faculty member of the Colson Fellows Program, and a professor of history at Central Connecticut State University. Glenn not only gets history, he also really gets worldview and, even better, how worldview and history are related.